Orowa no anuye hoshiki no an oro-oitak epakashinu kambi-sosh. No place: Printed for the Church Missionary Society, 1887. Yokohama: Printed for the Japan Mail Office, 1889. Chikoro utarapa ne Yesu Kiristo ashiri ekambakte-i A Matteu orowa no asange Pirika Orushpe. Tokyo: Printed for the British and Foreign Bible Society, 1889. The Ainu of Japan: The Religion, Superstitions, and General History of the Hairy Aborigines of Japan. Epesos un utara otta aomande, Pauros Nuye Kambi. The Epistle of Paul to the Ephesians. Yokohama: Bible Societies' Committee for Japan, 1893. 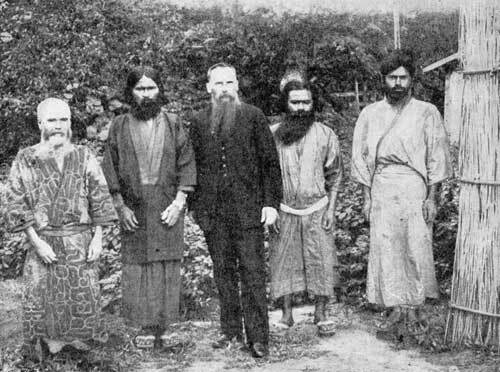 Galatians, Ephesians, and Philippians, in Ainu. Petros Sange. Atpake an Katorik Kambi. The First Epistle General of Peter. Yokohama: Bible Societies' Committee for Japan, 1894. Yakob sange katorik kambi. The General Epistle of James. Yoannes Sange. Re Ikinne an Kambi. The Third Epistle of John. Ainu Karisia Eiwange Gusu an Inonno-itak Oma Kambi. London: Society for Promoting Christian Knowledge, 1896. Chikoro utarapa ne Yesu Kiristo ashiri aeuitaknup oma kambi. The New Testament of Our Lord and Saviour Jesus Christ in Ainu. Yokohama: Printed for the Bible Societies' Committee for Japan by the Yokohama Bunsha, 1897. The Ainu and Their Folk-lore. London, Religious Tract Society, 1901. Sea-girt Yezo: Glimpses at Missionary Work in North Japan. London: Church Missionary Society, 1902. A Grammar of the Ainu Language. Yokohama: Kelly & Walsh, 1903. The Koropok-Guru or Pit-dwellers of North Japan, and, A Critical Examination of the Nomenclature of Yezo. The Pit-dwellers of Hokkaido and Ainu Place-names Considered.